Investors need a strong strategy to mitigate the recurring losses which are incurred due to complex borrower options, increase in mortgage delinquencies, and strict underwriting standards. The main aim of the strategy is to reach out to the stressed borrowers, deliver the best customer experience, and resolve all the issues faced by them. We at Outsource2india cover a wide range of loss mitigation support services, right from document processing to more complex processes which require market analysis and borrower outreach. Loss mitigation service experts at Outsource2india provide the best and unique solutions and expert mortgage assistance to lenders and borrowers around the world. 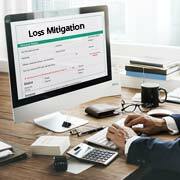 Why Choose O2I for Loss Mitigation Support? Outsource2india has been providing top-quality loss mitigation assistance services and a host of other mortgage services support to clients around the world for over 20 years now. Our cost-effective services help our clients to save a considerable amount of money and time and have a completely hassle free experience. We will help you scale up your business without having to worry about closing ratio efficiency. To optimize your loss mitigation and loan defaults outsource your loss mitigation support requirements to us by either writing to us or talking to one of our representatives and we will get back to you within 24 hours.